SCIC is excited to announce the 29th Annual Global Citizen Award Winners. 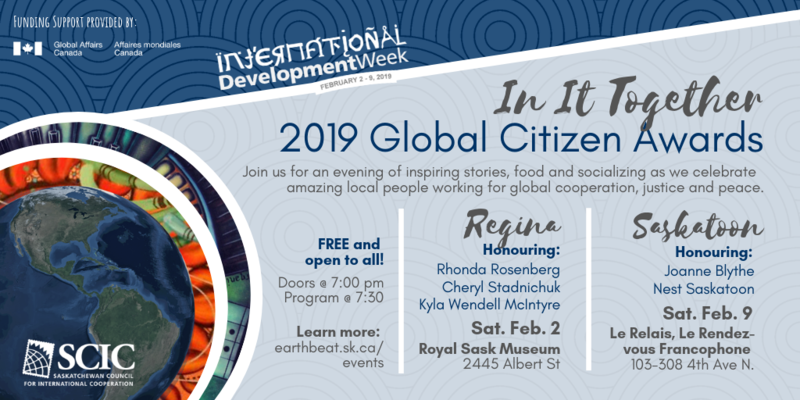 Join us February 2nd in Regina and February 9th in Saskatoon, as we celebrate the contributions of these amazing Saskatchewan people and movements working for a more just and sustainable world: Joanne Blythe, Nest Saskatoon, Rhonda Rosenberg, Cheryl Stadnichuk, and Kyla Wendell McIntyre. Event details can be found on the International Development Week page. You can also visit the Global Citizen Awards page for a complete list of winners since 1990.